Among other ambitious projects, the City of Paris is campaigning to have its many passages—historic glass-roofed passageways lined with small shops and restaurants—inscribed in UNESCO’s list of worldwide heritage sites, and all those who love these 200-year-old architectural marvels are applauding the initiative. The atmosphere that bathes the passages, with their translucent glass roofs and colorful mosaic tile floors, is old-fashioned, even downright antiquated. Some are nearly in ruins, practically abandoned, serving only as shortcuts or access to parking lots. Others, “colonized” by different waves of immigration, are so exotic that it’s hard to believe they’re not in Bollywood, Beijing or Bangkok. But more often than not, their charm wins out. Veritable oases in the city, these covered passages, meant for pedestrians, revolutionized the habits and tastes of Parisians. They influenced architecture and the decorative arts, inspired writers and photographers and aroused extraordinary public enthusiasm. And they proliferated all over Europe. On the eve of World War I Paris counted some 150 of them; today there are only 20, 17 of which are classified as historical monuments. Can they be restored without being turned into museums? Can the needed but costly renovations be financed in these private properties that, since they also serve as public thoroughfares, must meet certain safety standards? Can their past splendor be revived without interfering with the lifestyle of their current occupants? Because the passages house not only businesses, but also lodgings. For speculators, the desire to knock them all down is overwhelming. Danièle Pourtaud, assistant mayor of Paris in charge of heritage sites, reminded everyone recently that the city can only finance repairs to exterior facades, but it can also subsidize up to 25% of interior restoration work. She spoke at a conference on the future of the passages held several months ago at the Hôtel de la Monnaie, the French national mint, on the Left Bank’s Quai de Conti. The event brought together city officials, architects, historians, sociologists and members of the Association des Passages et Galeries. It wasn’t by chance that the conference was held at La Monnaie. Since Christophe Beaux, a former assistant to Finance Minister Thierry Breton, took the helm in 2007, a fresh breeze has swept through the venerable institution. With rock concerts, art installations, fashion shows and a recent exhibit of David Lachapelle’s audacious photographs, La Monnaie is no longer only a repository for coins and medals. A complete metamorphosis is in the works—if all goes according to plan, by 2012 the superb 18th-century building will be completely renovated and opened up to the surrounding quarter of Saint Germain des Prés with a brand new galerie-passage. The story of the passages begins with a prologue in 1786, when Philippe d’Orléans, a cousin of Louis XVI and a grand seigneur greedy for profit, outfitted the Palais Royal with stone arcades, whose stalls were soon filled with shopkeepers and crowds. 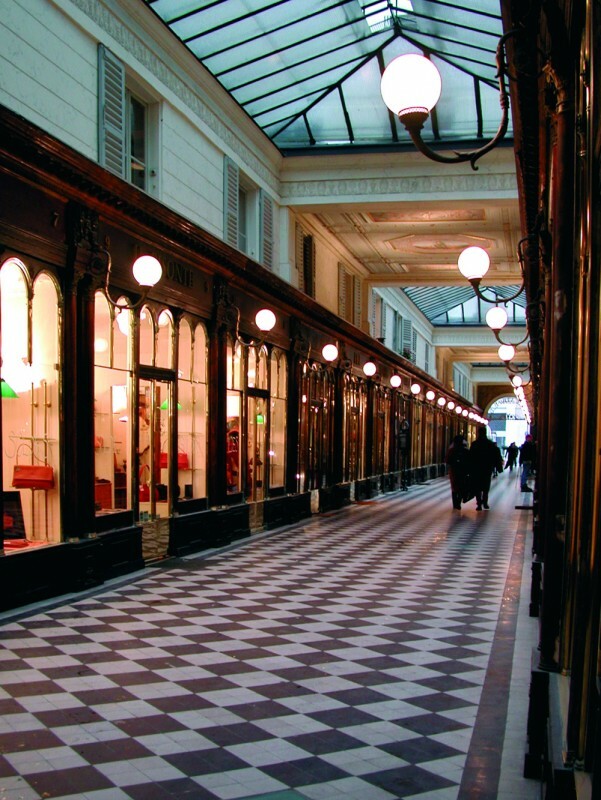 Philippe Egalité, as he was known, relined his purse and started a trend—his arcades, at least partially protected from the rain, provided a shopping gallery and a promenade for both socialites and the demi-monde. The Revolution and the Terror intervened (and Philippe Egalité lost his head) but with the advent of Napoleon the new covered passages began to appear. The oldest one still in existence, the 1798 Passage du Caire, was named in honor of Napoleon’s victory in Egypt, its street-side facade adorned with the sculpted heads of an Egyptian goddess. In the post-Revolutionary period, the passages were a perfect place for Parisians to let off steam and pursue all sorts of pleasures, licit and otherwise. “L’amour is a bird of passage!” quipped jokers. Restaurants, cafés, reading rooms, theaters and public baths proliferated under their glass roofs. But if the passages were once a symbol of urban modernity—an escape from dirty and crowded streets that had no sidewalks—they lost their allure as Baron Haussmann redesigned the city, starting in the 1850s. Paris was changing both in looks and in scale. Pedestrians could walk in the open air without tromping in mud. The arrival of department stores such as the Bon Marché, designed by Gustav Eiffel (1852), the Bazar de l’Hôtel de Ville (1856), Le Printemps (1865) and La Samaritaine (1869), where Parisians could stroll at leisure and find an unprecedented profusion of goods, hastened the passages’ decline. After that, Parisians became harder and harder to thrill. 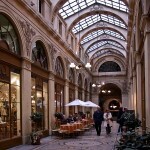 The passages were gradually deserted, while, strangely enough, they were becoming all the rage elsewhere in the world: the Galeries Saint-Hubert in Brussels, the immense Galleria Vittorio Emmanuele in Milan and the Cleveland Arcade in Ohio were all built in the mid-to-late 19th century. About 15 years ago, however, a few of the surviving Parisian passages started to emerge from their slumber, notably those located between the Grands Boulevards and the Palais Royal. 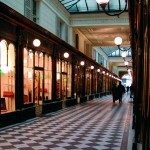 The Galerie Vivienne, in the 2nd arrondissement (entrances at 4 rue des Petits-Champs, 5 rue de la Banque and 6 rue Vivienne), is by far the loveliest, with its beige and blue mosaic floor, its ornate moldings and the bas-reliefs in its rotunda. First opened in 1823 and now entirely renovated and luminous, it’s a perfect example of a happy blend of contemporary chic and retro style. A modern pioneer in the galerie, the tea salon and restaurant A Priori Thé has been a Parisian favorite for 30 years; to sample the irresistible cheesecakes and crumbles offered by its American owner Peggy Hancock-Gilbert, it’s best to reserve. 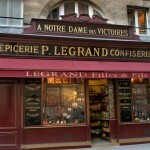 The boutiques of Jean-Paul Gaultier, Nathalie Garçon and Yuki Tori attract fashionistas, while the historic wine shop and gourmet grocery Legrand Filles & Fils, installed in a beautiful Belle Epoque decor, was taken over by new owners Christian de Chateauvieux and Gérard Sibourd-Baudry in 2000 and now offers regular wine tastings and a wine bar serving light meals, with tables set out in the passage in warm weather. And at the famous bookstore Petit-Siroux, once a favorite of such writers as Alfred Jarry and Louis Aragon, today you might see Catherine Deneuve or Isabelle Adjani rummaging through the shelves. By contrast, the Vivienne’s neighbor and former rival, the Galerie Colbert, built in 1826, seems frozen in its haughty beauty. After many vicissitudes—foremost among them, its rotunda was for a time transformed into a garage, the crowning ignominy for a place created for pedestrians—the Colbert has been sumptuously restored. But, alas, all life seems to have deserted it. There are no businesses in it at the moment, aside from a bookstore and boutique selling the postcards and posters of its owner, the nearby Bibliothèque Nationale de France. 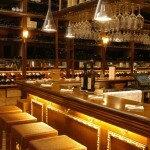 The passage’s sole attraction for the moment is the Belle Epoque brasserie Le Grand Colbert. The current shopkeepers of the labyrinthine Passage des Panoramas (between 10 rue Saint Marc and 11 blvd Montmartre) say much the same thing. Built in 1800, the passage owes its name to the huge circular paintings, or panoramas, that were displayed here by American entrepreneur James Thayer. Thayer had bought the rights to early panoramas from Robert Fulton, the father of the American steamboat, who first brought them to Paris; and among the painters of later panoramas was Louis Daguerre. According to Victor Hugo, these panoramas inspired an ongoing Parisian fad for “gadgets ending in -rama”. Hugo’s younger colleague Emile Zola described the passage in his 1880 novel Nana. Perfectly aligned in the same axis but on the other side of the Boulevard Montmartre, the Passage Jouffroy is home to the Musée Grévin, the city’s famed wax museum. The passage itself is a strange-looking place, all metal and glass, with a small hotel tucked inside, the Hôtel Chopin, which opened the same year the passage did, in 1846. Did the Polish musician, whose bicentenary is being widely celebrated throughout Europe this year, really live here? Will you bump into his ghost at a turn in the corridor? Or perhaps that of Landru, the early 20th-century serial killer who, they say, frequented these boulevards? Nothing will dispel these mysteries. 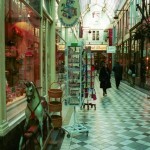 But mystery is part of the enduring charm of les passages de Paris. Originally published in the March 2010 issue of France Today.